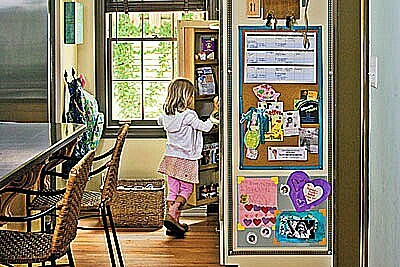 Great Organizational Tools for Families - Mom This! : Mom This! The other day I was wandering through a local game shop, looking for a fun boardgame for our family to enjoy in the coming winter months. It was one of those rare stores that carries a wide variety of great card and board games for every age group, as well as educational toys for kids. But the items that really caught my attention were a group of organizational tools for families. Some were chalkboards with painted sections for each family member to leave messages. Another was a kind of metal board with magnets that listed chores for the kids and magnets to show the progress on them. I found myself wondering if there were perhaps some great videos I could explore to find out how to do one of the organizational boards myself. Of course, there are tons of them, including this great one for organizing your kids for daily reminders.But you don’t need to stop with these, you can create your own. Sometimes it is also helpful to have a binder with form letters for schools and after school organizations. If you keep these, along with in and out baskets for the kids, it will make keeping up with the endless permission forms a snap. I have always loved the huge oversized wall calendars to organize things like appointments, games and plans for the family. Sometimes we have used them as a countdown to family vacations, helping us get ready in steps. You can also use a smaller chalkboard to note the urgent information for the day. If you have a separate phone at home, calling in messages during the day to remind you about changes as they happen can be jotted down on a chalkboard for tomorrow from your answering machine. Sometimes just the thought of getting your family organized can be overwhelming. You don’t have to do all of this at once. If your family has trouble keeping after-school activities straight, maybe that is your first project. If the kids are great at getting to baseball practice on time but “forget” to do their chores each week, then a chore board may be the solution. The key is to pick your battles, organize them in a way that is fun (prizes for the kids who get everything on their chore board done on time) and stick to your guns. Families are not supposed to be like a well-oiled machine, but at least with the help of these organizational tools, they don’t have to be chaotic.